To learn more about in-demand careers and programs at local community colleges, check out these great resources! Discover majors and in-demand careers and education based on your interests! On the Career Coach website, you can take a career assessment, explore careers and explore available programs that lead to the career you want. Here to Career is an easy way for users to find careers that match their interest and get connected with tools to be successful. With the mobile application, users can view salary information and high-demand career opportunities specific to their area and find a local community college with a program to help them achieve their goals. As students and their families make important decisions about investing their time and money in pursuing a college education, the California Community Colleges Chancellor’s Office is making available for the first-time comparative information about the earnings of recent graduates who received an award in a specific program area at California community colleges. The Inland Empire viewbook outlines career education pathways, careers, and average salaries for the priority sectors in the Inland Empire area. 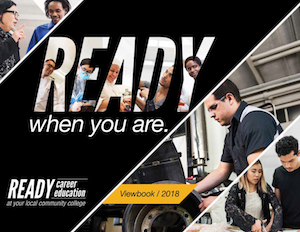 It is a helpful introductory resource for counselors, parents, and prospective students in considering Career Education options.